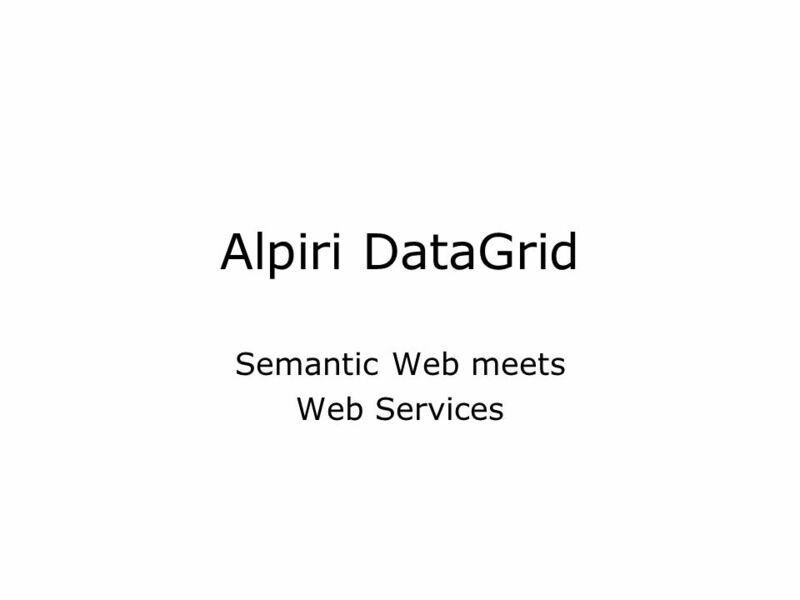 Alpiri DataGrid Semantic Web meets Web Services. 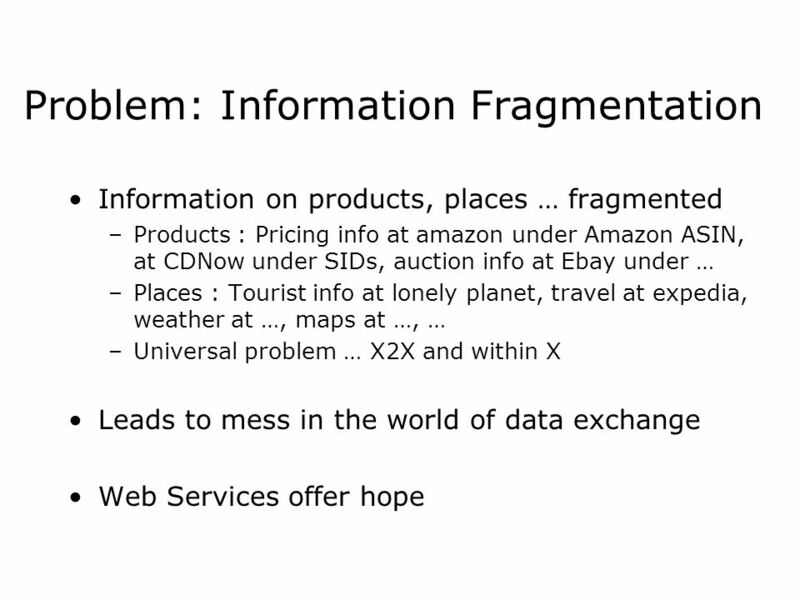 Problem: Information Fragmentation Information on products, places … fragmented –Products : Pricing info. 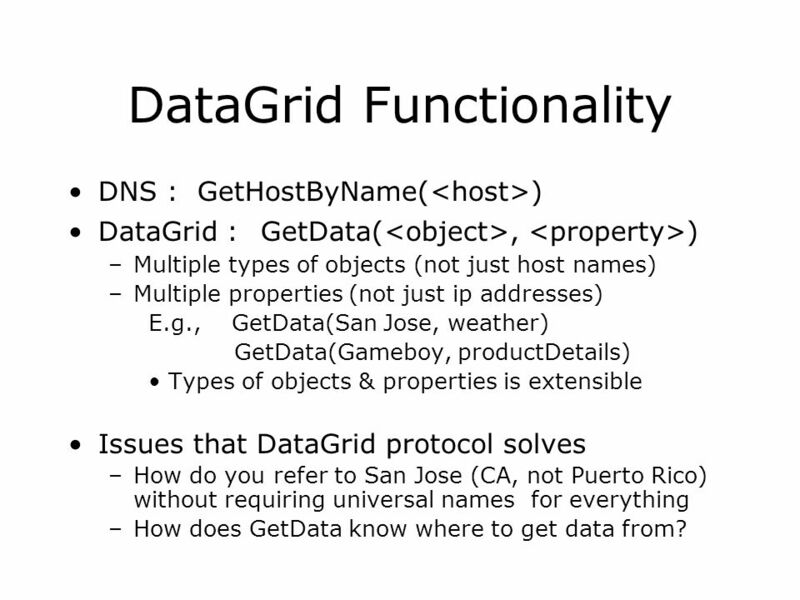 5 DataGrid Functionality DNS : GetHostByName( ) DataGrid : GetData(, ) –Multiple types of objects (not just host names) –Multiple properties (not just ip addresses) E.g., GetData(San Jose, weather) GetData(Gameboy, productDetails) Types of objects & properties is extensible Issues that DataGrid protocol solves –How do you refer to San Jose (CA, not Puerto Rico) without requiring universal names for everything –How does GetData know where to get data from? 8 Caching More sensitive to errors than DNS Pull-push caching scheme Request : Content-Length: … Proxy: Alpiri-Proxy/0.n QueryID: d8f894g Answer : Expires : … Update: QueryID: d8f894g DG Server Data Provider Update: QueryID: d8f894g www…. 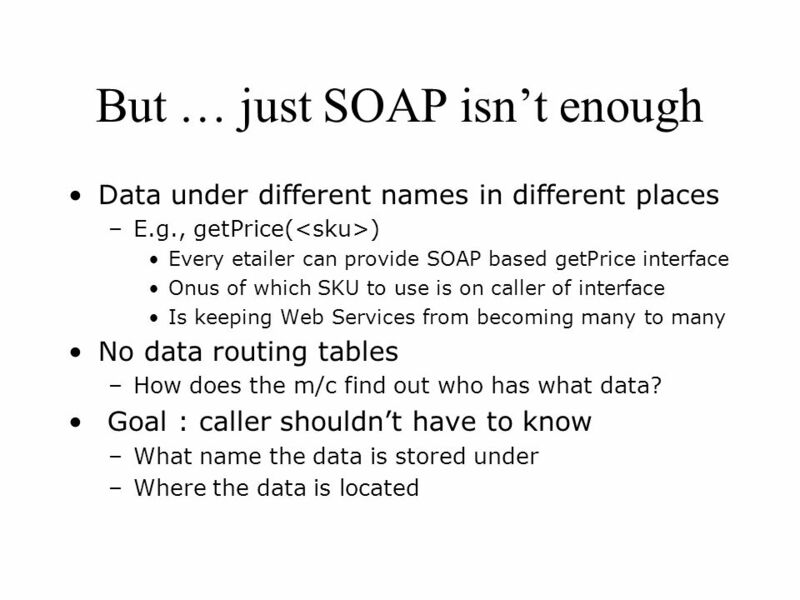 Download ppt "Alpiri DataGrid Semantic Web meets Web Services. 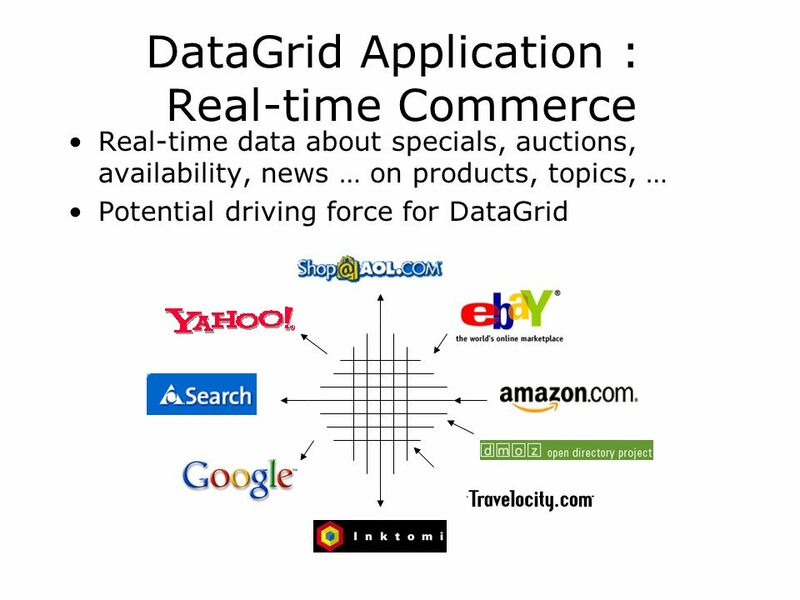 Problem: Information Fragmentation Information on products, places … fragmented –Products : Pricing info." Internet Applications INTERNET APPLICATIONS. 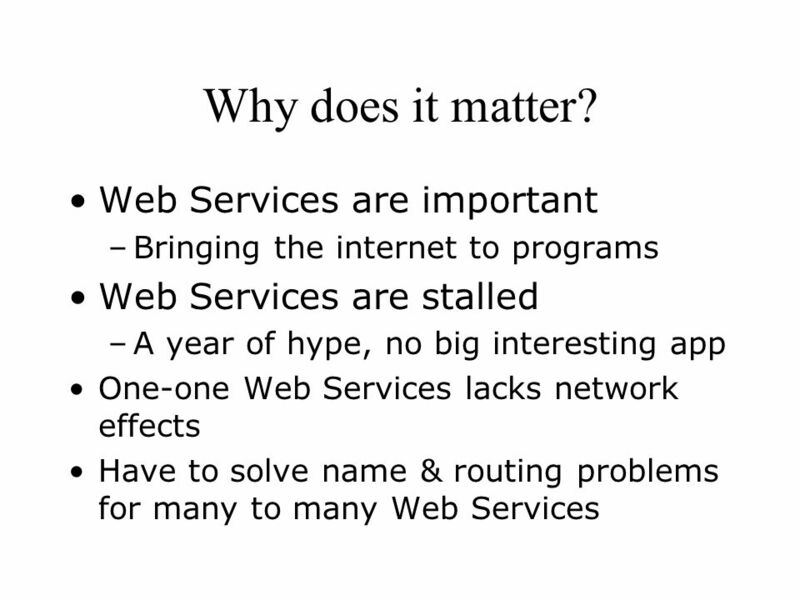 Internet Applications Domain Name Service Proxy Service Mail Service Web Service. 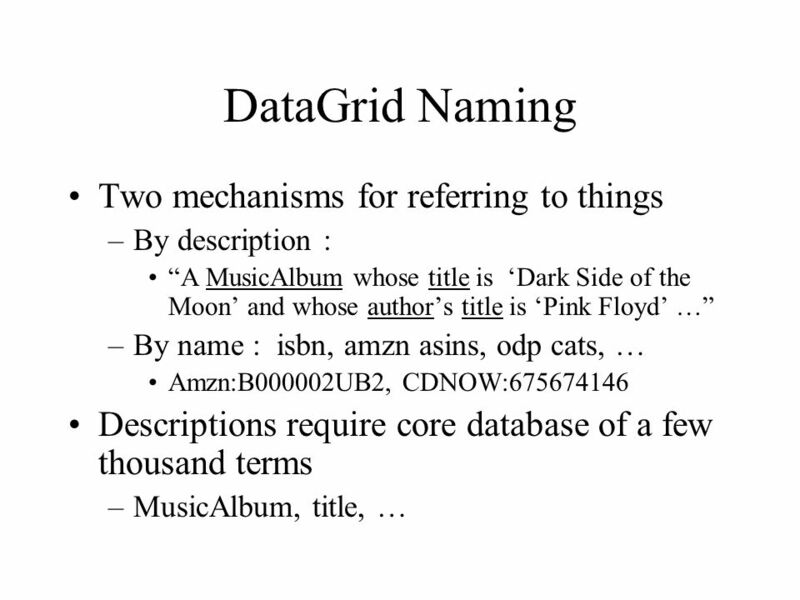 Retrieval of Information from Distributed Databases By Ananth Anandhakrishnan. 1 DNS. 2 BIND DNS –Resolve names to IP address –Resolve IP address to names (reverse DNS) BIND –Berkeley Internet Name Domain system Version 4 is still. T.Sharon-A.Frank 1 Internet Resources Discovery (IRD) Introduction to the Internet/WWW. Tanenbaum & Van Steen, Distributed Systems: Principles and Paradigms, 2e, (c) 2007 Prentice-Hall, Inc. All rights reserved DISTRIBUTED SYSTEMS. Semantic Search Jiawei Rong Authors Semantic Search, in Proc. Of WWW Author R. Guhua (IBM) Rob McCool (Stanford University) Eric Miller. Explore the Dreamweaver Workspace View a Web page and use Help Plan and Define a Web site Add a Folder and Pages, and set the Home page Create and View. 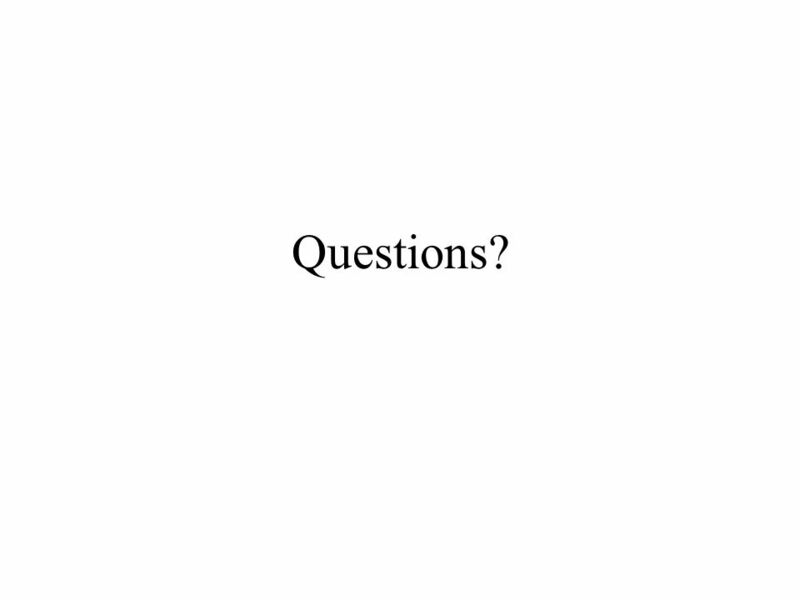 Web Servers How do our requests for resources on the Internet get handled? Can they be located anywhere? Global? CS335 Networking & Network Administration Wednesday, May 26, 2010. 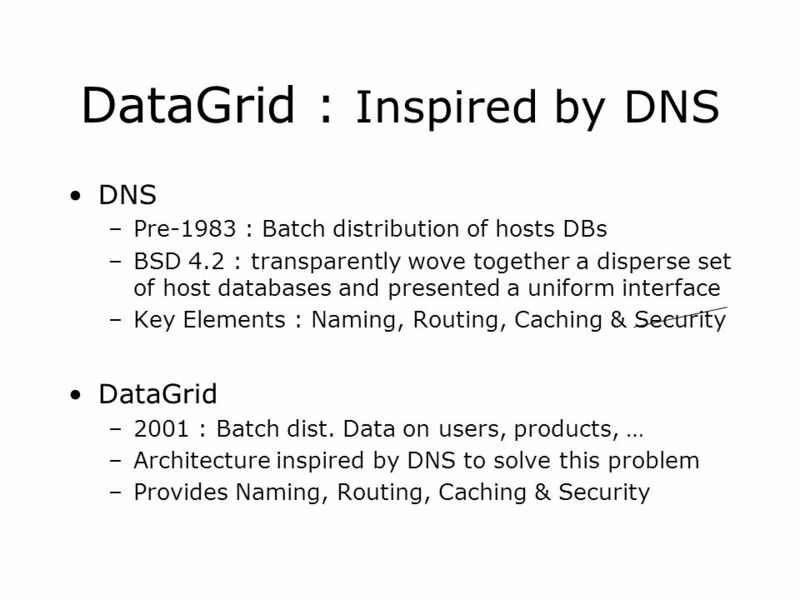 Domain Name System (DNS) Network Information Center (NIC) : HOSTS.TXT. Application Layer At long last we can ask the question - how does the user interface with the network? 588 Section 7 Neil Spring May 18, Schedule Homework 2 review DNS Active Naming. 7DS: Node Cooperation in Mostly Disconnected Networks Henning Schulzrinne (joint work with Arezu Moghadan, Maria Papadopouli, Suman Srinivasan and Andy. 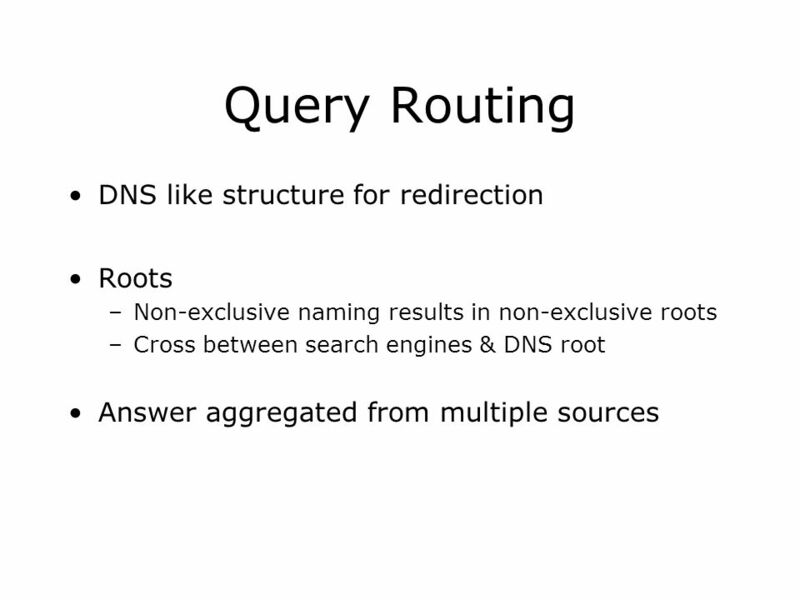 1 DNS,NFS & RPC Rizwan Rehman, CCS, DU. Netprog: DNS and name lookups 2 Hostnames IP Addresses are great for computers –IP address includes information. Intro to Computer Networks DNS (Domain Name System) Bob Bradley The University of Tennessee at Martin. MNO Cloud Use Case 2 Source: Rogers Wireless Contact: Ed O’Leary George Babut 3GPP/SA3-LI#43Tdoc SA3LI11_115. THE LARGEST NAME SERVICE ACTING AS A PHONE BOOK FOR THE INTERNET The Domain Name System click here to next page 1.